Canada's 'Father of Natural History', with a special love for insects. The label for this species in his own hand. Lectotype female of 'Andrena nigripes Provancher' Big-headed Andrena i.e. 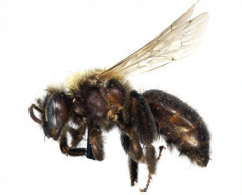 the actual individual bee caught by Provancher in 1895 used by him to identify it as a species "new' to science. As he was the flrst to describe the species scientiflcally, he got to give its Latin name. And in its offlcial complete Latin name, his name always appears too. Nature's son in childhood and then a father of the Catholic Church in parishes across Lower Canada, he carried out some of the earliest methodical field studies across all aspects of nature, and compiled some of the earliest -and long the only- written resources For many of them. He kept up an active network of correspondence throughout North America to share information among experts, and to encourage others to deepen their interest. Entomologist, botanist, writer, priest, science education advocate. 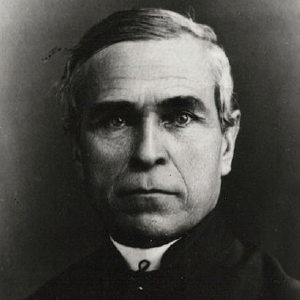 Provancher founded Le Naturaliste canadien, the first French-language scientific journal in North America, which today is distributed in 41 countries. 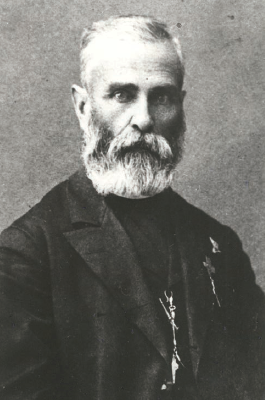 He wrote on many topics: insects, botany, parasites and fungal diseases. He discovered and described more than 1,000 species then unknown to science, especially in the order of wasps and bees. He wanted everyone to learn the sciences of nature, and campaigned For higher education in mid-19th century Lower Canada to teach more than theology, medicine and law. He pushed For a botanical garden in Quebec City and a museum of natural history at Universite Laval. Designated a Person of National Importance in Canada, his inspiration continues to this day, including in the work of the educational not-For-profit scientific cultural and historical organization La Maison Leon-Provancher in Quebec City, and by the Leon-Provancher Ecological Reserve on the south shore of the St. Lawrence River. His extensive writings were the 'bibles' for the next generation of naturalists and a pathway for beginners into a vast realm to explore. "This pursuit, as agreeable as it is uselut has many amateur enthusiasts who, it is hoped, will dive into the study al insects." 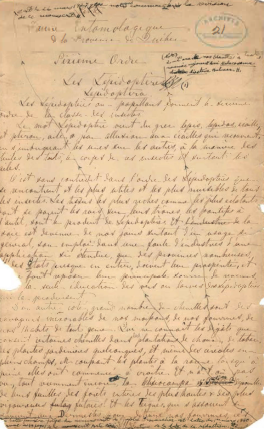 The manuscript of Insect Life of Quebec, the volume on butterflies and moths. Sources : Preface,« Additions et corrections a la fauna coleopterologique de la province de Quebec», 1877 par l'Abbe L. Provancher Estey, Ralph. H. (1994). Essays on the Early History of Plant Pathology and Mycology in Canada. McGill-Queen's University Press, 62. Developpement durable, Environnement et Lutte contra les changements climatiques Quebec. "Reserve ecologique Leon-Provancher. http://www.mddelcc.gouv.qc.ca/biodiversite/reserves/leon_provencher/res_59.htm; La Maison Leon-Provancher. http://www.maisonleonprovancher.com/index.html.